Using its getter and setter functions for size and position. Manipulating its affine transform, using its getTransform() and setTransform() functions while preserving the inherent size. Left and Top: measured from the upper left corner of the page to the upper left corner of the unrotated bounding box. Use getLeft() and getTop() to read the values. 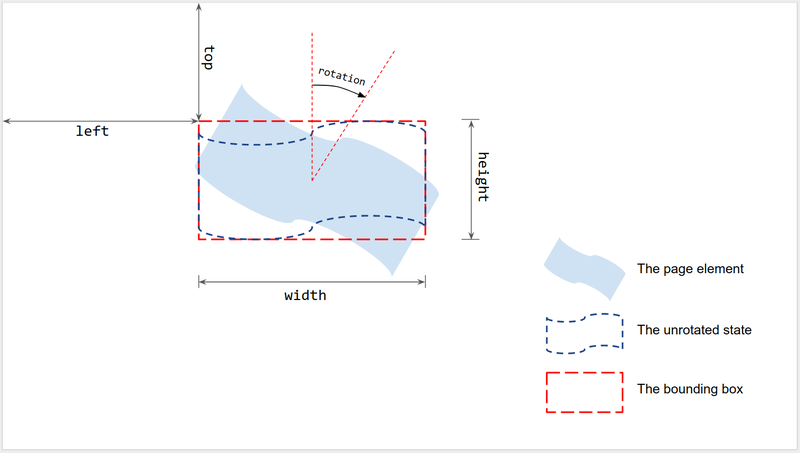 Width and Height: the width and height of the unrotated bounding box. Use getWidth() and getHeight() to read the values. Rotation: the clockwise rotation with respect to the vertical line around the center of the bounding box. Use getRotation() to read the value. All lengths are measured in points (pt). The rotation is measured in degrees (°). You can set the size and position of a page element when you create it using an insert method such as insertShape(). For an existing shape, you can set the size, position, and rotation; you can also set an element's scaling to resize or to reflect it along one of its edges. You can provide position and size information when creating a page element. Left: 100pt; Top: 200pt; Width: 300pt; Height: 60pt; Rotation: 0 degrees. Use setLeft() and setTop() to set the position of the upper left corner of the unrotated bounding box. 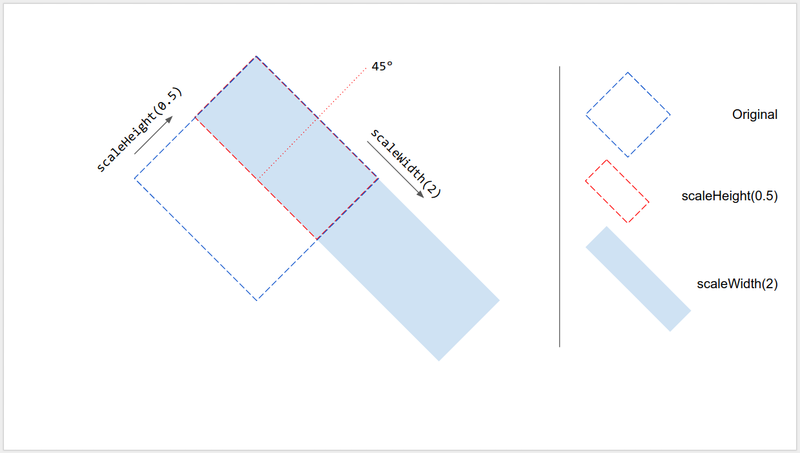 Use setWidth() and setHeight() to set the rendered width and height of the bounding box. Use setRotation() to set the clockwise rotation of the bounding box around its center. The following script creates a shape on the first slide of the active presentation, uses setters to update its position, size, and rotation, and reads the position and size information of the shape. Left: 100pt; Top: 200pt; Width: 50pt; Height: 60pt; Rotation: 90°. 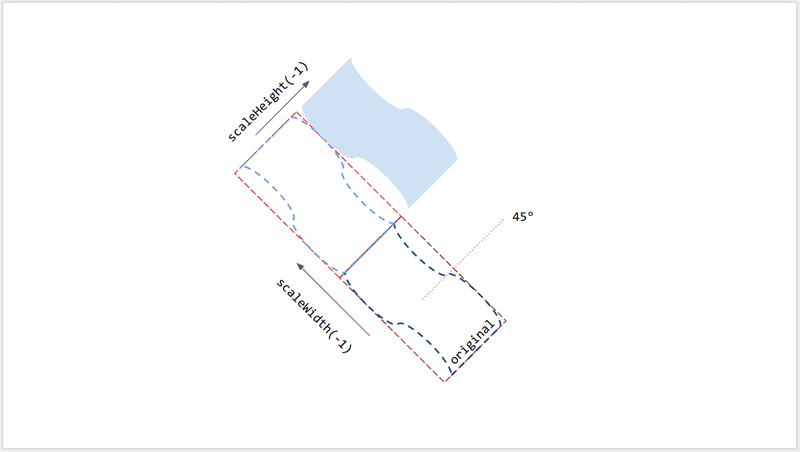 Instead of using setWidth() and setHeight() above to set the size of the shape to an absolute value, scaleWidth() and scaleHeight() can be used to stretch or squeeze a page element with a relative scaling factor. The figure below depicts how above code works on a 45°-rotated square shape. Note that the upper left corner of the bounding box is fixed during scaling. The argument in scaleWidth() and scaleHeight() can be negative so that they can be used to flip a page element horizontally or vertically. shape.scaleWidth(-1); // Flip horizontally along the left edge of the bounding box. shape.scaleHeight(-1); // Flip vertically along the top edge of the bounding box. The figure below depicts how above code works on a 45°-rotated shape. Note that the page element is flipped along one of the edges of its bounding box but not its center. Like other page elements, a line's rotation isn't the vertical angle of the line, but the rotation of its bounding box. When you create a line with specified start and end points, its rotation is always 0°. Dragging the endpoints of the line in Google Slides UI changes its vertical angle as well as the size and position of its bounding box, but doesn't change its rotation. Using setRotation() rotates the bounding box of the line, which effectively changes its vertical angle. So two lines can have the same visual vertical angle, but different bounding boxes and therefore different size, position, and rotation values. Some sizing and positioning methods are incompatible with some types of page elements. The table below summarizes the methods which are not compatible with certain types of page elements. All sizing and positioning methods may give unexpected results if the page element has shearing. All limitations are subject to change. Check reference for up-to-date information. For advanced control, the size and position of a page element can also be calculated and adjusted through its inherent (native) size and affine transform. Google Apps script provides similar interface to use affine transform as Google Slides API. getTransform() for the affine transform of the page elements. preconcatenateTransform() to pre-concatenate an affine transform to the current transform of page elements (similar to RELATIVE mode). The following script creates a shape, sets its transform, reads its inherent size, and reads its affine transform. Inherent width: 236.2pt; Inherent height: 236.2pt. Left: 100pt; Top: 200pt; Width: 472.4pt; Height: 236.2pt; Rotation: 0°.